Gov. Terry Branstad today said he will participate in a trade mission to China from May 29 through June 5. 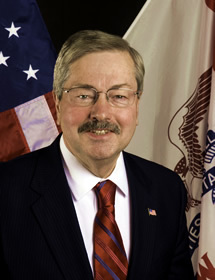 Branstad’s trip results from an invitation the governor accepted from Chinese Vice President Xi Jinping. A group of Iowans, fondly referred to as “Old Friends” by Chinese VP Xi Jinping, will join the governor in visiting China as they participate in a whirlwind tour from May 29-June 5. The group is also traveling to China at the invitation of the Chinese People’s Association for Friendship with Foreign Countries on behalf of VP Xi Jinping. They will visit various sites, including the Great Wall of China. During their stay, they will participate in a reunion banquet with VP Xi Jinping. At various stops apart from the “Old Friends” tour, Branstad will join Iowa Economic Development Authority Director Debi Durham in meetings to promote Iowa’s global partnership and pursue further economic opportunities in Iowa. The visit is a continuation of the long-standing relationship Iowa has with China, a vital trading partner with the state. In 1985, Iowa Sister States hosted VP Xi Jinping and four other agricultural experts from Iowa’s sister state of Hebei Province as part of an agricultural exchange. He returned to Iowa in February of this year to revisit several of his “old friends,” expressed his appreciation of the experience he had in Iowa, and to facilitate new joint efforts. Iowa and Hebei Province, PRC have had a sister state agreement since 1983. During those years, and even before, Chinese from Hebei Province have been visiting Iowa and participating in exchanges and programs. Included in the visit will be an overnight stay in Shijiazhuang, Hebei Province.